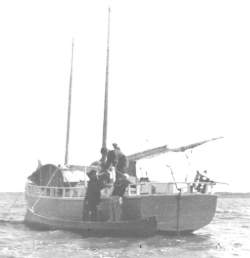 1939 Section A at Rupert's House, loading the schooner for sail across James Bay to Moose Factory. One canoe is already lashed onto the deck. The section had paddled from Oskelaneo to Mistassini then run the Rupert River. Rod Cox was staff. Dan Carpenter Sr. was a camper. We were out of sight of land for a good portion of the sail. To get to Moose Factory the sailor had to find the river channel and it was getting dark. He finally found it just before dark to the relief of all. But what a difference to trippers today who use planes to cover the same routes. One might say they don't know what they missed.